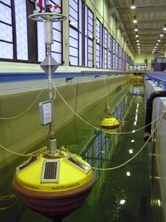 The CIEMLAB is the infrastructure where LIM/UPC carries out teaching, research and technology transfer based on experimentation with physical scale models in the field of Maritime and Coastal Engineering. A significant part of the current research performed at CIEM is supported by the Hydralab+ EU funded project, which is able to provide access to CIEM facilitiy to external researchers. LIM/UPC is part of MARHIS, Maritime Aggregated Research Hydraulic Infrastructures, a distributed esearch infrastructure (ICTS) of the Ministry of Economy and Competitiveness in Spain.